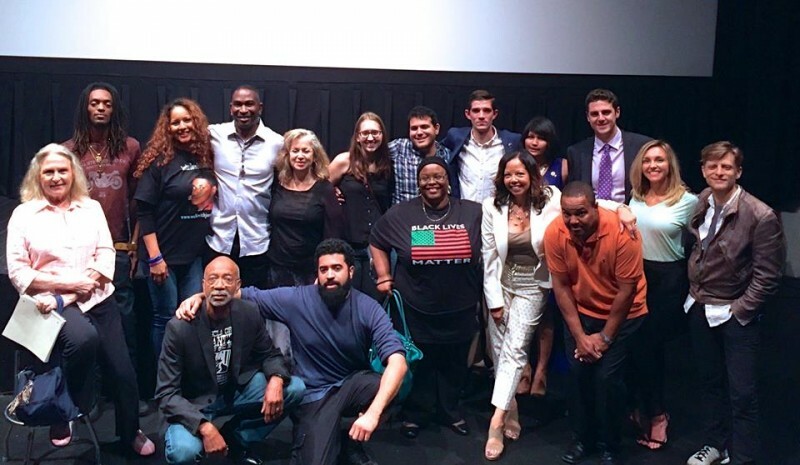 Documentary on Jordan Davis killing makes powerful statement against wave of racist murders | Fight Back! Jacksonville, FL - Duval County became the center of international attention following the murder of 17-year-old African American youth Jordan Davis by a racist vigilante in 2012. Jordan, along with three friends, was shot in a parked SUV at a gas station by Michael Dunn, a white 46-year-old man. After state prosecutors failed to win a guilty verdict for the first-degree murder charge of killing Jordan, Dunn was retried and eventually convicted in 2014, receiving a sentence of 90-plus years in prison. On April 17, I had the honor of attending a sold-out advanced screening of 3 ½ Minutes, a new documentary about the murder of Jordan and the ensuing Dunn trial. The documentary, directed by filmmaker Marc Silver, opened at Sundance Film Festival in January to widespread acclaim. Since then, HBO licensed the television rights for the film, and a full theatrical release is planned for July. I met Marc Silver in February 2014 during a march on State Attorney Angela Corey's office after the initial mistrial verdict was announced. As one of the many Jacksonville organizers of the Justice for Jordan Davis protests outside the courthouse, I was eager to see the film in its entirety, especially after the international attention it received at Sundance. In no uncertain terms, it exceeded even my highest expectations. Especially in light of the uprisings in Ferguson and Baltimore, 3 ½ Minutes is a must-see documentary for activists in the Black Lives Matter movement and people organizing against racist discrimination everywhere. 3 ½ Minutes largely follows Ron Davis and Lucy McBath, Jordan Davis's parents, as they seek justice for their murdered son. There was hardly a dry eye in the theater as friends and family recounted, on-screen, their memories of Jordan, especially his girlfriend's final interaction with him. The film's lack of any filmmaker narration stands out strongest in these scenes, as we are asked to consider the life of Jordan Davis from the people who knew him best. We get an intimate portrait of a very normal 17-year-old young man whose life was taken in the most brutal and unexpected manner. The fact that 3 ½ Minutes covers Davis’s life from this perspective is no small detail. The corporate media and the powers that be often try to demonize the victims of racist killings and police brutality. For instance, during the trial of his killer, George Zimmerman, the media effectively put Trayvon Martin on trial for having smoked a little weed and enjoying hip-hop. Even major newspapers like the New York Times and liberal commentators like Bill Maher got into the act after last year's killing of 18-year-old Michael Brown by a racist cop in Ferguson. The Times called Brown “no angel” in an editorial that highlighted his alleged past, and in one of his shows, Maher claimed that Brown was “acting like a thug.” 3 ½ Minutes cuts through any media tropes of Davis, and in doing so, challenges the deep-seeded racist stereotypes about Black men that fuel these murders. One of the most important points the documentary emphasizes is that the trial of Michael Dunn was about racism, not “loud music,” as the corporate mainstream media wanted many to believe. CNN constantly referred to the legal proceedings as the “loud music trial.” State Attorney Angela Corey's prosecuting team at times seemed to echo Dunn's defense attorneys in downplaying the obvious racism that motivated the killing. True to the actual course of events, 3 ½ Minutes diligently covers the courthouse protests and marches taking place across Jacksonville for Justice for Jordan Davis. While certainly not the focus, the documentary makes clear that the people of Jacksonville, particularly the Black community, responded to the killing of Davis and demanded justice in the streets. Silver interviewed many organizers of these protests, who are shown and heard in the film. Wells Todd, an organizer with the Jacksonville Progressive Coalition, says at one point, “It's time to pick up where Dr. King left off” in building a mass movement against racism. 3 ½ Minutes follows the mass mobilization in the streets of downtown Jacksonville on the night of the mistrial verdict, which marched on State Attorney Angela Corey's office to demand a retrial. Having marched that night, I thought the film captured the outrage felt by the crowd, many of whom flocked to the courthouse after hearing the verdict. Corey's office already felt massive pressure from the people of Jacksonville over her botched prosecution of George Zimmerman and her persecution of Marissa Alexander, the 35-year-old Black mother who fired a warning shot to fend off her abusive husband. That night's march on her office, however, forced the prosecution to go back to the drawing board and pull out all the stops to get a first-degree murder conviction of Dunn. Although the film is masterfully shot and edited to perfection, 3 ½ Minutes is difficult to watch at times, especially for people living in Jacksonville. The film has a lot in common with another highly acclaimed documentary about racism in Jacksonville, Murder on a Sunday Morning (2002), which covered the police framing of then-16-year-old Brenton Butler for a murder he didn't commit. Murder on a Sunday Morning won the Academy Award for Best Documentary that year, and there's no question that 3 ½ Minutes deserves the same honor. Sadly the relevance of powerful documentaries like these reflects how racist killings continue to happen more than 50 years after the Civil Rights Movement. In light of the mass uprising against racist police crimes in Baltimore and last year's rebellion in Ferguson, 3 ½ Minutes' message could not be more timely.